Beelzebub is a 6-month-old Hereford show calf that presented for lethargy to a clinic in Louisiana. Blood culture resulted in significant numbers of motile parasites. 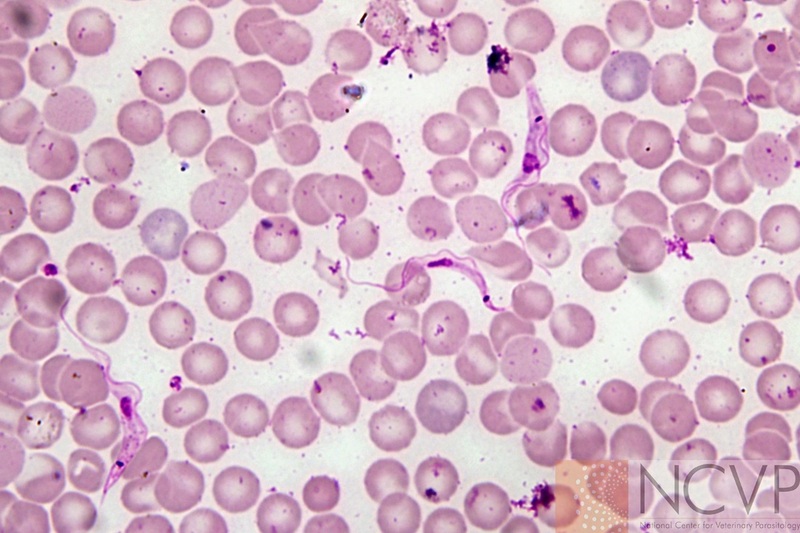 Blood film evaluation (below) revealed several protozoan parasites. What is the parasite? Trypanosoma theileri; a non-pathogenic hemoflagellate parasites of cattle throughout the world. Transmission of T. theileri to cattle is through the feces of infected horse flies (i.e., stercorarian transmission). Pathogenicity of T. theileri has never been demonstrated conclusively and infection is considered subclinical. Trypomastigotes of T. theileri are considered an incidental finding and other causes of the clinical signs observed should be considered. However, when present as a co-infection with other pathogens (e.g. Anaplasma marginale), some believe that T. theileri may be pathogenic or contribute to the clinical disease process. Böse R, et al. 1987. Transmission of Trypanosoma theileria to cattle by tabanidae. Parasitology Research 73: 421–424. Lee YF, et al. 2013. Evidence of intracellular stages of Trypanosoma (Megatrypanum) theileri in non-phagocytic mammalian cell. Veterinary Parasitology 191: 228–239.